6-1　I haven't received a response to my email. 6-2　I haven't received an order confirmation mail. 6-3　When will my package arrive? 6-4　Can I make an order with my cell phone? 6-5　How tall are your models? 6-6　Is it possible for me to pay through Paypal and have the item shipped to my Japanese address? 6-7　Are you recruiting for any models? Thank you for visiting Innocent World’s official website. Innocent World’s designer, Yumi Fujiwara, has made a unique brand shop providing elegant and cute clothing. We are taking orders for our merchandise through this website. In addition, we will accept orders by phone, fax or email. Our original and head shop is in Osaka, but we have since opened many throughout Japan, so please stop by when you are in the area. The color and appearance of materials may differ from the actual item depending on your monitor. We aim to be as faithful to the original item as possible, so we ask for your understanding in advance. We ask your parents' agreement for orders from junior customers. Thank you. You can order from our website using the shopping cart system (domestic customers only). If you do not wish to use the shopping cart, you may also order by phone, fax or email so please choose your preferred method. If you have any questions regarding our products, send us a message using the “Contact Us” webform. The first field is for your name, the second field is for your email address, then there is a drop down list for the purpose of your message, and the last field is for your comment. Go to the specific page of the item you'd like to buy. If an item has ご予約コーナー(Reserve corner) posted on the page, that means it is now up for reservation. The expected arrival period of the item as well as dates you can request your package to arrive (domestic shipping only) will be posted on the site so please refer to those when making your order. ※Even though an item might be able to go into your shopping cart, there is still a possibility that it is sold out. Enter the appropriate information as the form specifies. If you have a preferred day and time you would like delivery, select that as well. If you would like to receive our mail magazine (in Japanese), check the box. If you want to stop receiving the mail magazine or see sample issues, please visit the following website. Next you can select if you have or want a Member’s Card or combined shipping. After confirming there are no mistakes click “Order confirmation” 「注文確認」. 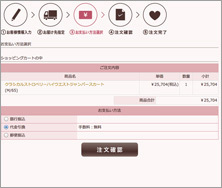 After confirming that the contents of your order are correct, click "Order decision" 「注文確定」. This is the final screen you will see. An automatic reply mail will be sent to your email address. At this point the availability of the merchandise in your order is not confirmed so please wait for the order confirmation email. Innocent World will send you an order confirmation email within 3 working days. We will inform you if the item is in stock, your total and ways to pay. After confirming that the information is correct, please make your payment within one week. In the case of COD payment, please pay when the item arrives. I haven’t received an order confirmation mail. ※Your order will be set when you receive an order confirmation email from us and is subject to change until that time. ※Please do not pay before you receive an16:57 2010/01/07 order confirmation email from us. Once we have gathered the items in our warehouse, we will ship them out. For times when you cannot use the shopping cart, please include the following information when you call, fax or email. We will contact you afterwards about whether we have the items you requested in stock and your payment total. ・Delivery information ? name, address, postal/zip code and phone number (if it differs from your contact information). ・Your payment method (customers within Japan please choose from bank transfer, postal transfer, COD or credit card; customers outside of Japan must use Paypal). ※Credit card payments (from within Japan) must processed through Kuroneko(Yamato)@Payment(クロネコ＠ペイメント). ・Your preferred delivery day and time (Japan only)? Choose a date between 5 days to 2 weeks after your order is completed. ※ Please choose from Morning (午前中), 12:00-14:00 (12時～14時), 14:00-16:00 (14時～16時),16:00-18:00 (16時～18時), or 18:00-21:00 (18時～21時). ※we will charge the above fee regardless of your order amount. ※ Because long umbrellas require a special package size, they will be shipped separately and shipping will be charged. If you would like to add new items once your order is completed, unfortunately we can not change your order so you will have to start a new one. If you would like all of your items shipped together, be sure to check the box for combined shipping (同時梱包を希望する). If you do not check it, we will send the orders as they were received. We do not accept cancellations once your order is complete so please make your orders with due care. If you become a problematic customer by canceling repeatedly or refusing to pay for COD items, please know that you may not be allowed to order from our online shop in the future. Due to the fact that we have many stores and shared stock, we do not have a set amount of each item in our inventory. Because of this, there are times when an item may be mistakenly shown as available online but is actually sold out. So please wait for your order confirmation email or Paypal invoice to make sure the item is available. The homepage of our website has current information about the status of our inventory as well. Member’s Cards can be used at our stores (excluding the Nagoya shop) and for domestic online sales. Points are collected based on the amount of money spent and the method of payment-see below. Once you collect 20 points, you will receive a discount coupon for 5,000 yen which you can use towards your next purchase of 10,500 yen (including tax) or more. Cash, bank transfer, postal transfer and COD payment methods will receive 1 point for every 5,250 yen including tax. Points for payment by credit card will be 1 point per 15,750 yen including tax. ※ Your Member's Card will expire one year from the last purchase listed. ※ You cannot use another discount coupon at the same time as your 5,000 yen Member's voucher. ※ Sale and set items are not eligible for points. ※ If we reissue you a new Member's Card, please be aware that the points on the old card will become invalid. ※ We cannot add together the points from multiple Member's Cards. ※ Member's Cards and use of points are not available at the Nagoya shop. When you are at our stores, show us your Member’s Card when you pay to receive points. We will issue a new Member’s Card for you. Select this if you have a card of your own. We will send you point stickers that you can put on your Member’s Card. If your card is full, make sure to tell us 新しい台紙希望 (I would like another card). Choose this if you already have made a Member’s Card that is being held for you at Innocent World. We will add the points for you. Choose this if you are not interested in receiving points. ※Sale and set items are not eligible for points. ※If your total does not reach the minimum to receive points, we will not make you a Member’s Card even if you request one to be made with your order. ※From now on we will not be keeping Member’s Cards here at Innocent World; we will be sending them to the customers. We will mail your coupon within two weeks. Please contact us if you do not receive it in two weeks. ※Coupons may be used in-store or at our online shop. If you have a completed Member’s Card you’d like to redeem along with an order, indicate商品券発行希望 (I would like a coupon) somewhere in your letter, and send the Member’s Card to us within one week. ※ You can only use your coupon on purchases over 10,500 yen (including tax). Customers that have collected all 20 points on their Member’s Card or are waiting for a coupon should either indicate満了メンバーズカード使用希望 (I would like to redeem my Member’s Card) or商品券発行希望 (I would like a coupon) when they order. When we create the invoice for your order we will reduce the total by 5,000 yen. Please send us your completed Member’s Card or coupon within one week. Please indicate通販で使用希望 (I would like use this for the online shop). ※We cannot take responsibility for Member’s Cards that get lost due to postal accidents so please take appropriate precautions such as sending your card with tracking, etc. When you make a password with your order, the next time you log in your information will be saved, cutting down on time. Also the next time you order, you can edit the appropriate fields and your information will be saved. After we receive payment, we collect all of the items from our stock and then send out the order. If reserved items are included in the order, we wait until all of the items are available before we ship.If there is no delivery date selected (domestic shipping only), then we ship the orders within 2 weeks of receiving payment. ※If you would like to purchase multiple items but would like separate shipping, please make separate orders. ※If you would like us to ship multiple orders together, please indicate同時梱包を希望する(I would like combined shipping). Shipping time may vary based on location. ※Weather, traffic and other conditions may additionally affect shipping time. We aim to send out orders in the shortest amount of time possible, but due to the way our inventory is set up, there may be cases when it takes us longer than expected to complete your order. We also can not speed up your order or move you to the head of the line. We appreciate your understanding in advance. When a requested item is not in stock at the online sales stockroom, we must request it to be sent to our office by one of our store locations. In such cases it can take a few days to a week to reach our office so we may not be able to meet your requested delivery date (domestic post only). If necessary, we will email you to change your preferred delivery date. If we are not able to contact you we will just send it when it is ready. Orders are shipped to your requested delivery date and time. If the time between the day you ordered and your requested delivery date is short, there may be times where we will not be able to meet your request due to inventory that is on order from our store locations. We would appreciate it if you would give us as much time as possible in that window. We don't accept combined shipping. Please order all of the items together. Please choose from the four options below. You must have access to a computer or cell phone that has an internet connection and email capabilities. We will be sending you an email about payment after we confirm your order so please take the steps necessary to make your payment. When we confirm your order by email, we will notify you about the condition of your merchandise, order total, and give you instructions about how to pay. If you select an advance payment method (bank transfer, postal transfer or credit card), we ask that you make the transfer or payment within a week. For COD, please pay for the item when it is delivered. In cases where you receive the wrong merchandise or damaged items make sure to contact us within one week of receiving your package. We do not accept returns or exchanges if the item does not fit or if you do not like the color so please take due care when ordering. Make sure to contact our office within one week of receiving your package. We will notify you about the procedure to return or exchange the item. ※Please be sure to include your name, address and phone number. 6-1　I haven’t received an automatic response to my order. Depending on the mail filter, emails from Innocent World can end up in your spam folder and never reach your inbox. Make sure to check your spam folder, deleted mail folder or any other related place it could be. If you are heavily filtering your mails, make sure to grant permission for our domain name, “@innocent-w.jp”. Once we receive your order, we will send a confirmation email within 3 working days. If 3 days pass and you haven’t received anything, there is a possibility that something has gone wrong with your order so please contact us. We apologize for the inconvenience. We send a reply mail to all orders or other correspondence within 3 working days. At sale times or around holidays when we are especially busy, sometimes it can take 2 or more working days to respond. Please be sure to refer to the calendar on our homepage to see when holidays will be (marked in red). We have been having problems with failed email delivery to customers with Yahoo! Mail accounts. The mail doesn’t go to the spam folder; it just disappears on its own. If at all possible, we ask that you please use a different mail service for your orders and inquiries. In cases where you do not receive an expected mail from us, please contact us with the mail form accessible at the “Contact Us” section of our website, phone, or fax. If you use the mail form, be sure to use another email address to avoid further email problems. It really depends on the state of our inventory and whether we have to request items to be sent from our store locations. In general, we ship within between 3 days and 2 weeks of receiving your order. For domestic post, if everything moves smoothly your package will be delivered on the day you request. However there are some cases when the day you request is too soon for your items to arrive at our office so we cannot meet your requested day. Please refer to your order confirmation email if you have questions about the status of your items, how to pay, or the requested package arrival date. Yes, but if the shopping cart does not work on your phone, please submit your order by phone call, fax or email. Payment methods are the same four as usual: bank transfer, postal transfer, COD and credit card. For details, please reference the guides on phone, fax and email orders. At this time we do not have a website set up for cell phone viewing so please use the PC site viewer feature on your phone to access our main site. Innocent World uses several models so we cannot make generalizations about their height. For a question about a specific model, we ask you to please contact us by email. 6-6　I live in Japan but I don’t have a bank account or a credit card here. Yes, we can do that. Please make your order using the Order Form for Overseas Customers instead of the shopping cart. No, we are not recruiting for any models now. If you want to be our model, please contact us through your agency. The sizes listed on our website correspond to the following list. ※Depending on the item, the sizes might be slightly smaller or larger. The measurements listed are of the actual garment so we recommend 4-5cm of room for the best fit, especially for blouses.